Permaculture is a science of combining forest ecology with growing food. 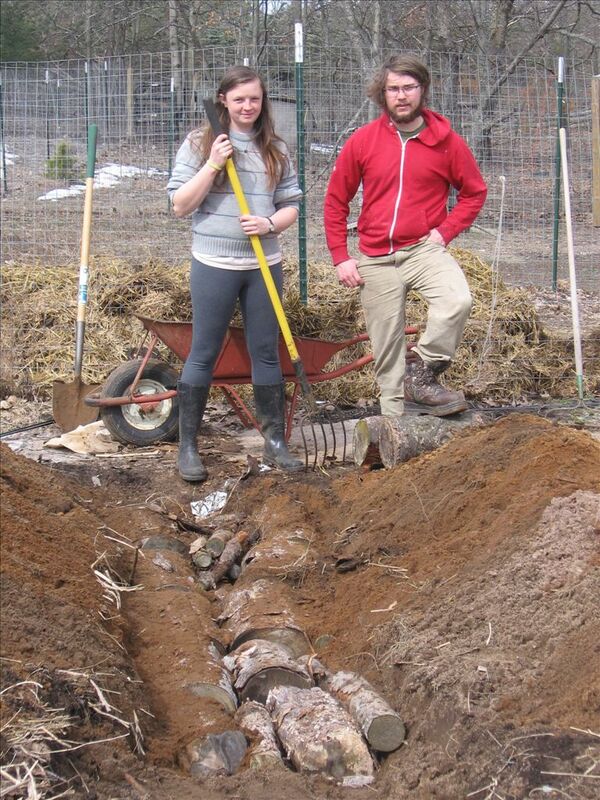 Here at Morganic Farm we are finding many ways to bring ecological balance into our garden. Hugakulture's are a double digging technique we like to employ that helps build and enhance our sandy soil. We dig a trench and lay down logs and other woody mass, we then cover the trench with the dirt again and add a layer of compost on top. The garden is now ready for planting! The logs will quickly start to rot with prolonged contact with the soil and the rotting logs do an excellent job of retaining moisture and holding nutrients. They also provide a host for mycelium (mushroom roots). Mycelium interact with plants by providing them with moisture and minerals, in exchange plants give mycelium sugars. We help this along by actually introducing mycelium into our garden and feeding it cardboard (in the form of mulched pathways). Worms also love the card board mulch. The cardboard serves the purpose of keeping weeds off our path and acting like leaves in a forest by keeping the earth covered and retaining moisture and feeding soil critters. To learn more about including permaculture in the garden visit our website.